"b". Size: 21B72. Padlock Stamp #: 0455-E. Color: Green. Made for: Baldwin Locomotive Works, Eddystone, Pennsylvania. Mfg by: Best. "Babcock & Wilcox Co.". Size: 1B60. Padlock Stamp #: 0909-E. Color: Green. Made for: Babcock & Wilcox Co., Milwaukee, Wisconsin and Barberton, Ohio. Mfg by: Best. "Ball". Size: 4B70. 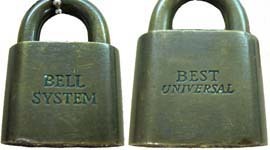 Padlock Stamp #: 0380-E. Color: Green. Made for: Ball Brothers Company, Muncie, Indiana. Mfg by: Best. "BAMBERGER'S SECURITY". Size: 2B61-M1. 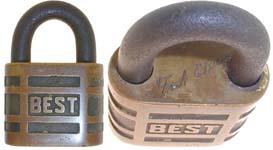 Padlock Stamp #: 1524-E. Color: None. Made for: Bamberger's Department Store, Newark, New Jersey. Mfg by: Best. "BAYSTONE". Size: 2B52. Padlock Stamp #: 0887-E. Color: Not determined. Made for: Baystone Construction, Muncie, Indiana. Mfg by: Best. "BAYWAY". Size: 1B62. 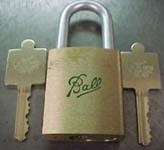 Padlock Stamp #: 1463-E. Color: Green. Made for: Exxon Bayway Refinery, Linden, New Jersey. Mfg by: Best. "B•C•E•". Size: 2B54. 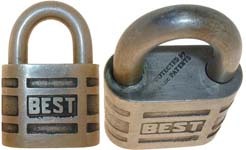 Padlock Stamp #: 0856-F. Color: Green. Made for: British Columbia Electric, Vancouver, British Columbia, Canada. Mfg by: Best. "B•C•E". Size: 5B. Padlock Stamp #: Not determined. Color: Not determined. Elliptical case. Made for: British Columbia Electric, Vancouver, British Columbia, Canada. Mfg by: Best. "bec". Size: 4B62. 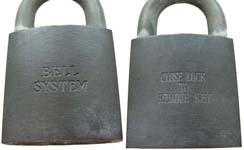 Padlock Stamp #: 1567-E. Color: Black. Made for: Brooks Erection & Construction Company, Granite City, Illinois. Mfg by: Best. "BECKETT PAPER". Size: 21B72. Padlock Stamp #: 1922-R. Color: Green. Made for: Beckett Paper Company, Hamilton, Ohio. Mfg by: Best. "BELL SYSTEM". Made for: Western Electric, Chicago, Illinois. Mfg by: Best. "BELL SYSTEM". Size: 2B43. 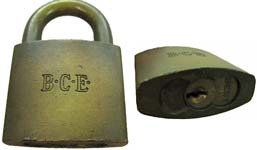 Padlock Stamp #: 0142-F. Color: Green. Made for: Western Electric, Chicago, Illinois. Mfg by: Best. "BELL SYSTEM". Size: Not determined. Padlock Stamp #: Not determined. Color: Not determined. Elliptical case. Made for: Western Electric, Chicago, Illinois. Mfg by: Best. "BELL SYSTEM". Size: Not determined. Padlock Stamp #: Not determined. Color: Not determined. Flat case. Early 4 pin core. Made for: Western Electric, Chicago, Illinois. Mfg by: Best. "BELLE ISLE CREAMERY". Size: 2B53. Padlock Stamp #: 0119-F. Color: Green. Made for: Belle Isle Creamery, (Borden's Farm Products Company of Michigan, Detroit, Michigan). Mfg by: Best. "BEMIS". Size: 2B62. 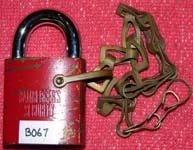 Padlock Stamp #: 1353-E. Color: Red. Made for: Bemis Co., Seattle, Washington. Mfg by: Best. "Benton County PUD". Size: 21B72. Padlock Stamp #: 1631-R. Color: Blue. Made for: Benton County Public Utilities District, Kennewick, Washington. Mfg by: Best. "BEST" - " CLOSE LOCK TO REMOVE KEY". Size: 4B72. Padlock Stamp #: 1569-E. Color: Green. Mfg by: Best. "STOLEN FROM BETHLEHEM STEEL CO. SHIPBUILDING DIV. BOSTON YARDS". Size: 4B62. Padlock Stamp #: 0362-E. Color: Green. Made for: Bethlehem Steel Co. Mfg by: Best. "STOLEN FROM BETHLEHEM STEEL CO. SHIPBUILDING DIV. BOSTON YARDS". Size: 2B69. Padlock Stamp #: 0363-F. Color: Not determined. Made for: Bethlehem Steel Co. Mfg by: Best. "B. F. G.". Size: 61B72. Padlock Stamp #: 0438-E. Color: Green. Made for: B. F. Goodrich Co., Louisville, Kentucky. Mfg by: Best.